, an eminent French protestant clergyman, was born at Sauvetat in the province of Angenois, in 1619, and studied grammar and philosophy under his father Francis Claude, also a minister, ~and a man of great piety, and afterwards went through a course of divinity at Montauban, where he was ordained in 1645. He was made minister of the church of la Treyne, where he officiated a year, and then became minister of a church of St. Afric in Rovergne and eight years after, pastor of that of Nismes. 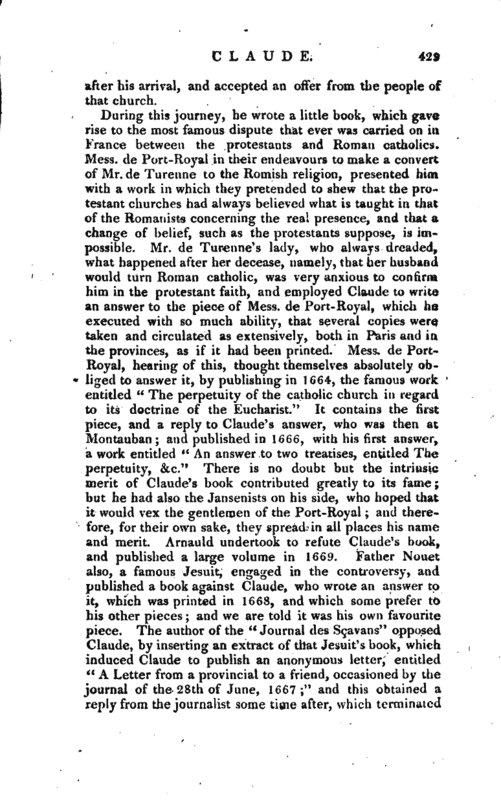 As the protestants had an university in the city of Nismes, Claude had an opportunity of displaying one of his chief talents, that of happily explaining a theological subject; and he used to read private lectures to such as were candidates for the ministry. 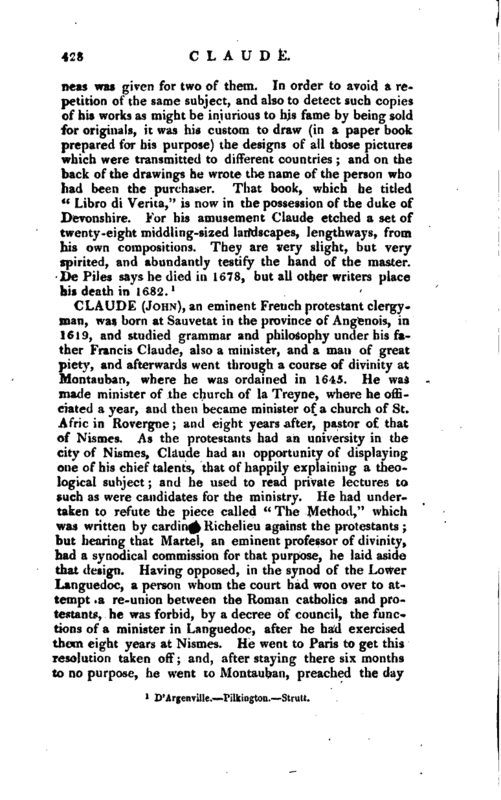 He had undertaken to refute the piece called “The Method,” which was written by cardinal Richelieu against the protestants; but hearing that Martel, an eminent professor of divinity, had a synodical commission for that purpose, he laid aside that design. Havfng opposed, in the synod of the Lower Languedoc, a person whom the court had won over to attempt a re-union between the Roman catholics and protestants, he was forbid, by a decree of council, the functions of a minister in Languedoc, after he had exercised them eight years at Nismes. He went to Paris to get this resolution taken off; and, after staying there six months to no purpose, he went to Montauban, preached the day | after his arrival, and accepted an offer from the people of that church. During this journey, he wrote a little book, which gave rise to the most famous dispute that ever was carried on in. France between the protestants and Roman catholics. Mess, de Port-Royal in their endeavours to make a convert of Mr. de Turenne to the Romish religion, presented hin with a work in which they pretended to shew that the protestant churches had always believed what is taught in that of the Romanists concerning the real presence, and that a change of belief, such as the protestants suppose, is impossible. 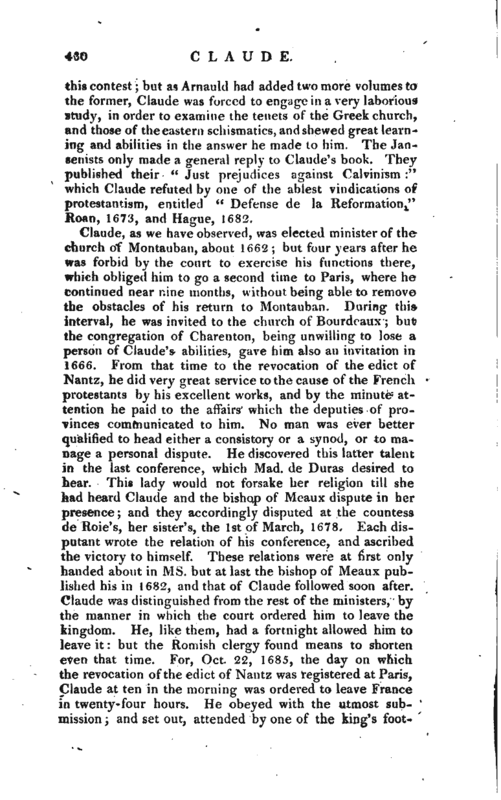 Mr. de Turenne’s lady, who always dreaded, what happened after her decease, namely, that her husband would turn Roman catholic, was very anxious to confirm him in the protestant faith, and employed Claude to write an answer to the piece of Mess, de Port-Royal, which he executed with so much ability, that several copies were taken and circulated as extensively, both in Paris and in the provinces, as if it had been printed. Mess, de PortRoyal, hearing of this, thought themselves absolutely obliged to answer it, by publishing in 1664, the famous work entitled “The perpetuity of the catholic church in regard to its doctrine of the Eucharist.” It contains the first piece, and a reply to Claude’s answer, who was then at Montauban; and published in 1666, with his first answer, a work entitled “An answer to two treatises, entitled The perpetuity, &c.” There is no doubt but the intrinsic merit of Claude’s book contributed greatly to its fame; but he had also the Jansenists on his side, who hoped that it would vex the gentlemen of the Port-Royal; and therefore, for their own sake, they spread in all places his name and merit. Arnauld undertook to refute Claude’s book, and published a large volume in 1669. Father Nonet also, a famous Jesuit, engaged in the controversy, and published a book against Claude, who wrote an answer to it, which was printed in 1668, and which some prefer to his other pieces; and we are told it was his own favourite piece. 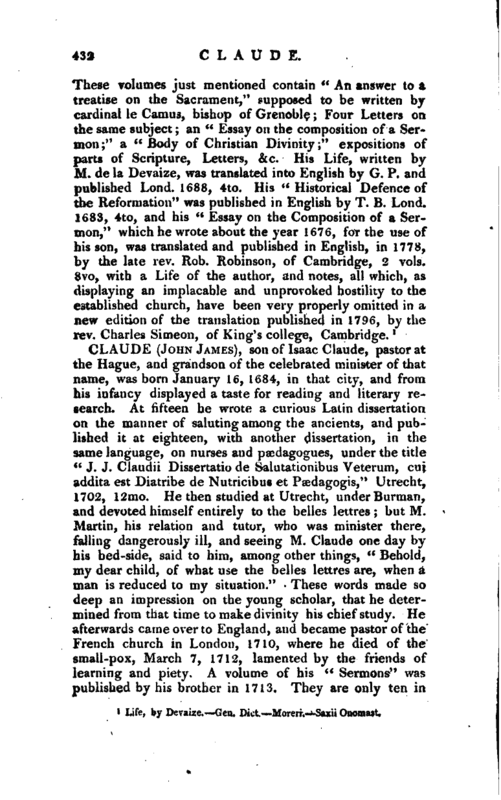 The author of the “Journal des S^avans” opposed Claude, by inserting an extract of that Jesuit’s book, which induced Claude to publish an anonymous letter, entitled “A Letter from a provincial to a friend, occasioned by the journal of the 28th of June, 1667” and this obtained a reply from the journalist some time after, which terminated | this contest; but as Arnauld had added two more volumes to the former, Claude was forced to engage in a very laborious study, in order to examine the tenets of the Greek church, and those of the eastern schismatics, and shewed great learning and abilities in the answer he made to him. The Jansenists only made a general reply to Claude’s book. They published their “Just prejudices against Calvinism:” which Claude refuted by one of the ablest vindications of protestantism, entitled -“' Defense de la Reformation,” Roan, 1673, and Hague, 1682. Claude, as we have observed, was elected minister of the church of Montauban, about 1662; but four years after he was forbid by the court to exercise his functions there, which obliged him to go a second time to Paris, where he continued near nine months, without being able to remove the obstacles of his return to Montauban. During this interval, he was invited to the church of Bourdeaux; but the congregation of Charenton, being unwilling to lose a person of Claude’s abilities, gave him also an invitation in 1666. From that time to the revocation of the edict of Nantz, he did very great service to the cause of the French protestants by his excellent works, and by the minute attention he paid to the affairs which the deputies of provinces communicated to him. No man was ever better qualified to head either a consistory or a synod, or to manage a personal dispute. He discovered this latter talent in the last conference, which Mad. de Duras desired to hear. This lady would not forsake her religion till she had heard Claude and the bishop of Meaux dispute in her presence; and they accordingly disputed at the countess de Roie’s, her sister’s, the 1st of March, 1678. Each disputa’nt wrote the relation of his conference, and ascribed the victory to himself. These relations were at first only handed about in ms. but at last the bishop of Meaux published his in 1682, and that of Claude followed soon after. Claude was distinguished from the rest of the ministers, by the manner in which the court ordered him to leave the kingdom. He, like them, had a fortnight allowed him to leave it: but the Romish clergy found means to shorten even that time. For, Oct. 22, 1685, the day on which the revocation of the edict of Nantz was registered at Paris, Claude at ten in the morning was ordered to leave France in twenty-four hours. He obeyed with the utmost submission; and set out, attended by one of the king’s | footmen, who was ordered to conduct him to the frontiers of France; and who, though he executed his orders faithfully, yet treated him with civility. He travelled in the Brussels coach; and his fame flying before him, procured him much kind and hospitable attention during his journey. He passed through Cambray, where he lay; and was there presented with some refreshments by the Jesuits. Even their rector paid him a visit, which Claude returned; and the difference of religion did not interrupt this interchange of civilities. Having arrived at Holland, he met with a very kind reception, and was honoured with a considerable pension by the prince of Orange. 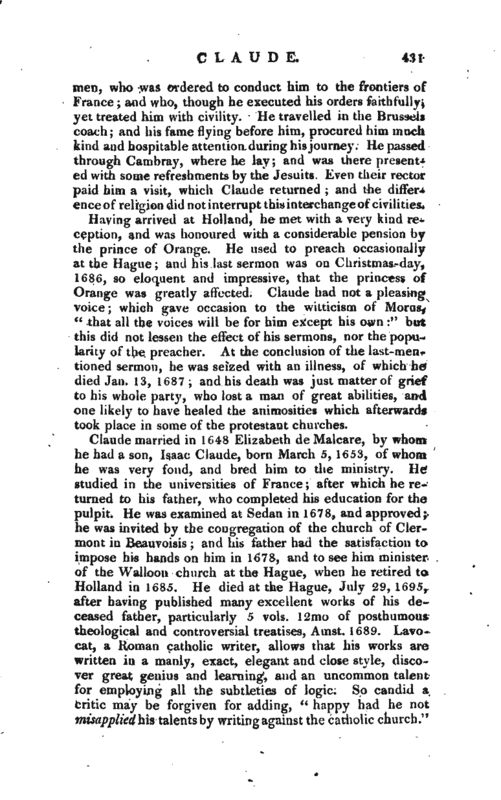 He used to preach occasionally at the Hague; and his last sermon was on Christmas-day, 1686, so eloquent and impressive, that the princess of Orange was greatly affected. Claude had not a pleasing voice; which gave pccasion to the witticism of Morus, “that all the voices will be for him except his own” but this did not lessen the effect of his sermons, nor the popularity of the preacher. At the conclusion of the last-mentioned sermon, he was seized with an illness, of which he died Jan. 13, 1687; and his death was just matter of grief to his whole party, who lost a man of great abilities, and one likely to have healed the- animosities which afterwards took place in some of the protestant churches. Life, by Devaize.—Gen. Dict.—Moreri.—Saxii Onomast.